Keep your client's documents secure and safe in Legal Binders Now's professional document holders. Designed to hold documents up to 8 1/2" X 14", our holders provide ample storage for all your client's documents. Constructed of high quality leather print, our document holders provide security and easy access to critical estate documents for you and your clients. 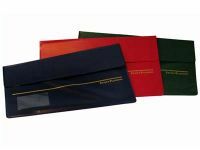 Whether you use the holders to present documents to your clients or use them to organize and carry documents to meetings, our legal document holders present a professional image in a practical package. Our Estate Planning Legal Document Holders keep documents organized for presentations and meetings. They are an ideal way for clients to keep their estate papers organized.